Lately, I’ve been working on multiple projects. No really? Anyone who knows me is not the least bit surprised. Given my to-do list, working on a variety of things each day is a must. That’s no problem when I’m working on nonfiction. That’s because the voice in nonfiction is largely my own. Whether I’m explaining to a group of writers how to get their debut novel into an editor’s hands or telling a parent how to take their children through a writing exercise, I write it the way I would tell them how to do it face-to-face. But lately, in addition to my nonfiction, I’ve been working on two or three fiction projects at a time — a middle grade novel (magical realism), a young adult novel (fantasy) and a young adult short story (contemporary). Each of the main characters has a distinct voice, which is a good thing. But given how different each of these pieces is from the others, moving from one voice to another has been difficult. Read about how I finally solved this problem on the Muffin. Just a quick note: The image that shows below may make you wonder if I’ve lost my mind. Seriously, the trailer is moody but not grim. Why oh why it picked that image to park on is beyond me. Does this trailer pass the test? I’d say yes because I had my husband watching over my shoulder. Part of the reason that this one works so well in my opinion is that it keeps you off balance. First you half a family photo — father and preschool son. But then you realize that ol’ Dad has a seriously dark side. He’s a serial killer and the narrator is his son. Based on the narrative, I found myself making assumptions. The images are moody and somber but they pull you in. Just how much does junior empathize with good ol’ dad? But . . . come on . . . there’s the title . . . This trailer did a lot of things right. I tend to like stills better than film clips. Everything — images, tone, font, colors, voice — worked together. Does this give you any thoughts about a trailer for your own current project? What tone would you need to convey to match your manuscript? Is there something you could do to keep the reader off balance? What kinds of images would you use? My third and final attempt at poetry is the found poem. Found poetry begins with a piece of writing that the author has found. It can be anything from a billboard to a newspaper article or a diary entry to a worksheet. To create a found poem, remove words from the writing sample. You cannot rearrange word order. That part if fixed. The finished poem does not have to retain the meaning of the original. Feel free to change verb tense, punctuation, capitalization and whether or not something is plural or singular. For my own attempt, I stared with a historic letter. It is one of the Civil War Love Letters posted by the Missouri Historical Society here. James Love and Eliza Wilson were secretly engaged before he left for the Civil War. For some reason that floored me. If you’re going to risk defying your families and one of you is GOING OFF TO WAR, why get secretly married. These were both adults. No one was under-age. And James very much wants to make their engagement public. The letter I have is almost four pages of transcribed text. If they had done things my way, he would have written her this letter instead. Mine was love at first sight. I often think of our wedding. You have my life to the end. I am blessed beyond words in your true love. I pray I may ever return it as you deserve. Many of the found poems I read start with a writing sample with one tone and the poem has a completely different tone. That was what I tried for here. More Song of Solomon and less angst ridden Romeo. What can I say? I prefer a happy ending. 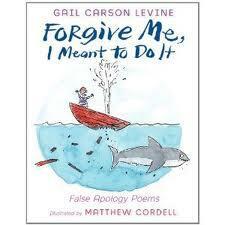 A book of False Apology poems for young readers. Yesterday I wrote about the poetic form called the reverso. I even shared my own attempt with you although I think it is majorly bad. And today’s attempt looked just as bad until I had an epiphany. Have you ever done something and felt compelled to apologize in spite of your lack of sympathy? That’s basically the point of a False Apology poem. False apology poems are inspired by the poem that William Carlos Williams penned after eating the plums his wife was saving for breakfast. The rules are simple — you have to apologize for something and not really mean it. Think insincerity. Or sarcasm. Throughout my first attempt at a false apology poem I kept thinking, “I don’t apologize if I’m being insincere. I don’t even bother.” And, thus, my first attempt was stinko. Then it hit me — depending on how you do insincerity it can be an awful lot like sarcasm. I live and breathe sarcasm. Suddenly it looked much more do-able. In a false apology poem, you’re supposed to be a little mean. That said, William Carlos Williams’ poem doesn’t seem even a little mean to me. Nope. Not happening. His poem is three stanzas of four lines each and all of the other false apology poems I’ve read follow this pattern. Here is my second attempt – much, much better than my first attempt. This is a frustrated parent poem. Sorry folks, this is just where things stand today. Not great but then I never claimed poetry as a talent! April is national poetry month so I’ll be doing three posts on poetry this week. The first is on a poetic form that I just learned about — the reverso. 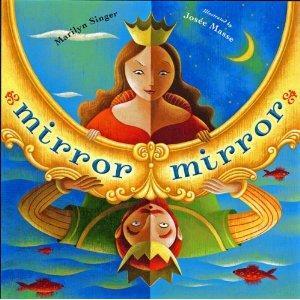 Marilyn Singer not only uses this form in her book Mirror Mirror, she actually created the reverso. In a reverso, you read the lines in one order in the first half of the poem. The second half of the poem has the same lines in reverse order. The only things that you can change are capitalization and punctuation. Ideally, the meaning is often very different, often ironically so. To see what I mean, read this poem from Mirror Mirror. Personally, I thought this form looked impossibly difficult but decided to try writing a very short reverso. I can’t say that this is any good, but I did manage to accomplish the reverse meanings. Now, please. Go read some good poetry and be inspired to write! As far as word count is concerned, I had a fair week last week. I managed to pull down 6047 out of 6000 words. Not bad. Some of my goals have been rearranged for me. One of the editors I’ve been courting is leaving publishing so the manuscript she suggested I work on has been de-prioritized. I still plan to write it — I pitched it to her because I really like the idea. 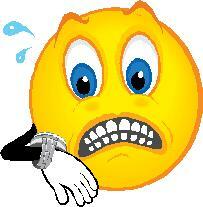 But other things are scooting up the priority list since I no longer have an editor waiting for this particular piece. I also had another contract come along so that switches things around a bit but in a very good way. 2 reviews on the Bookshelf. Done. Write my posts for the Church blog. Done. Rewrite the piece that I’m working on for an educational publisher. My deadline: 4/27. Done. Work on the middle grade. I want to have the first chapter done for critique at the retreat. Deadline: 4/27. Done. Rough out the activities for Education.com. Deadline: 5/8 Done. Write next piece for the Muffin, the WOW blog. Deadline: 5/11 (will be posted 5/12). In progress. Solicit my last interviews for the next CW article in my rotation. Deadline: 5/15. In progress. Solicit interviews for the CW piece after that. Deadline: 6/15. Get a fiction picture book back out. Get a nonfiction picture book back out. Get a chapter book back out. Do some more research on my next nonfiction picture book. How often do you manage to do something surprising with your work? Or are your stories pretty predictable? This is what I was thinking about after I saw some pictures of the orukami (Origami) created by Himanshu Agrawal. Not only does his work encompass the amazing pieces that I think of us “normal” origami (a variety of small animals) but he does other work on a much larger scale. Check out his work on his Flickr stream and you’ll see a Western-styled dragon made out of newspaper and an Eastern-styled dragon made out of the metallic foil used in cigarette packages. Not only is the paper he uses sometimes a bit unusual but you’ll find some pieces here that are much larger than a human. So, what can you do to make your own work larger than life? Special thanks to Ann Martin of All Things Paper who first brought Himanshu Agrawal’s work to my attention. Characters need to be sympathetic. Ironically, I’ve been going around with one of my editors about how to make my teen readers see a particular character as sympathetic. And I don’t mean “going around” as in disagreeing. She’s right. He needs to be or they simply won’t read the story. My editor and I have been talking over this particular point. The irony comes around because of my recent reading. Its ironic because I’ve recently read several books with abrasive or otherwise unsympathetic main characters. The books that I finally enjoyed, all set the main character back a few steps but in a way that wasn’t the main character’s fault. Yep, they were all launched out of their whiny self-centered comfort zones but it was always involuntary and never their own doing. In each case I came to like the various characters because I felt sorry for them. In Nevada Barr’s Track of the Cat, I felt for alcoholic Anna Pigeon when she finds the body of a fellow ranger. Who wants to find a stiff in the middle of a perfectly good work day? In Wayne Thomas Batson’s The Door Within, Aidan Thomas must move across the country when his grandfather can no longer live alone. Not only does he come to appreciate the old man, I came to appreciate him as he fought to stay alive and help the country in which he found himself. In Maile Meloy’s The Apothecary, I initially found Janie to be more than a bit shallow and vapid. But when she has to move to England and then helps a classmate hide and goes with him on an adventure to save the world, she won me over. There was one unsympathetic character who didn’t win me over. I won’t pan the book but suffice it to say that he was so in love with himself that when he was murdered I couldn’t help but be relieved. Mean? Perhaps, but true. Take the time to check your grammar! How often have you asked someone to read a story or article only to have them find a grammar goof? If you’re anything like me, you actually have a few standards. Mine are all homonyms — there/their/they’re and write/right being my usual problems. I really enjoyed this list of 15 grammar goofs that you need to avoid to look like the pro you are. Okay, the list itself wasn’t that fun but I loved the illustrated write-ups at the end of the article? My favorite is the same one my son picked out — check out #15, the zombie dangling participle. Anyone who lives in the Midwest gets the title. Anyone who doesn’t can just be glad that they’re missing out on our windy weather. Deadlines and rewrite requests do amazing things for your word count. Last week I didn’t quite make my goal (6000 words/week). This week I surpassed it with 8934 words. That’s a whole lot of blog posts and two articles. Yes, I worked on my middle grade novel but didn’t count that on this weeks word count. I’ll count it when the chapter is done. 5 posts for One Writer’s Journey. Done. Rewrite the piece that I’m working on for an educational publisher. My deadline: 4/20. In progress. Write the interview questions and start soliciting interviews for the CW piece after that. Deadline: 6/15.